It was a historic night for Boston University at the NHL Draft, as four Terriers were selected in the opening round. It is only the second time in league history that four athletes from the same college program were drafted in the top 30. Incoming stars Clayton Keller, Dante Fabbro and Kieffer Bellows, as well as returning defenseman Charlie McAvoy, all heard their names called Friday night at First Niagara Center in Buffalo. Read on to see which NHL teams took a chance on some of the best BU has to offer. 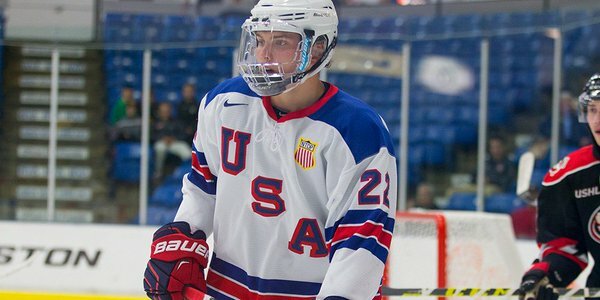 The U.S. National Team Development Program’s all-time leading scorer was called up to the stage early on, as Keller was drafted seventh overall by the Arizona Coyotes. The 17-year-old is the sixth Terrier ever to be a top-10 selection. Keller, who tallied 37 goals and 70 assists for the U.S. NTDP last season, is now part of a Coyotes team that went 35-39-8 in 2015-16 and missed the playoffs for the fourth straight year. Arizona ranked 24th in goals scored and 20th in power play percentage, which could explain why the team opted to go with a natural scorer like Keller. It remains likely the 5-foot-10 forward will don the Scarlet and White for the 2016-17 season, but the Coyotes can take comfort in knowing they secured one of the top offensive playmakers in this year’s draft. After an impressive freshman campaign on Commonwealth Avenue, McAvoy was selected by the Boston Bruins with the 14th overall pick. A mobile and creative blueliner and a member of last season’s Hockey East All-Rookie team, McAvoy, 18, follows in the footsteps of former teammate Matt Grzelcyk, a defenseman drafted by the Bruins in the 2012 NHL Draft. The Bruins barely missed the playoffs with a 42-31-9 record and finished 19th in the league in goals against. Bruins general manager Don Sweeney made it a priority to pick up a solid defenseman in this year’s draft, and McAvoy will likely provide a significant boost somewhere down the road. One of nine incoming Terriers, Fabbro was taken 17th overall by the Nashville Predators. Fabbro is a strong all-around defenseman who excels at moving the puck. He was named the British Colombia Hockey League Defenseman of the Year last season after recording 67 points with the Penticton Vees. The 18-year-old should contribute in the next year or so for his favorite NHL team in the Predators, who went 41-27-14 last year and reached the second round of the NHL playoffs. Bellows ended up with the New York Islanders, who took the forward with the 19th overall pick. 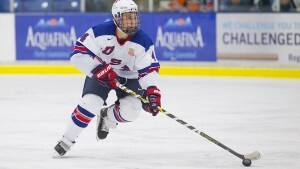 Bellows, 18, is proficient at finding the back of the net, becoming the fourth 50-goal scorer in U.S NTDP history last season. The son of former NHL forward Brian Bellows, Kieffer joins Terrier captain Doyle Somerby as a member of the Islanders, who went 45-27-10 in the 2015-16 season. Bellows likely will need a couple of years with BU head coach David Quinn before moving on and bringing his physical style of play to the professional level. The NHL Draft continues Saturday at 10 a.m. with rounds 2-7 on NHL Network. It’s official: The Boston University men’s hockey team boasts a nine-member recruiting class for the 2016-17 season. The Terriers took to Twitter Friday afternoon to announce each player individually, with several confirmations and one surprise arising. In sum, head coach David Quinn will soon be marshaling an additional six forwards, two defenseman and a goaltender. Without further ado, below is the complete list, with jersey numbers also included. Jake Oettinger (#29): This U.S. National Team Development Program netminder seems a likely challenger for the starting role from day one onwards. He put up a .908 save percentage and 2.38 goals against average last season, and boasts a 6-foot-4 frame. Dante Fabbro (#17): The reigning BCHL Defenseman of the Year, Fabbro arrives on BU’s campus on the tail end of a 67-point season. He has also long represented Canada at the youth national team level, and is almost a guaranteed pick in the first round of the 2016 NHL Draft. Chad Krys (#5): The NTDP roots keep on coming with Krys, who scored three goals and handed out 26 assists across the 2015-16 season. Krys also was a member of the bronze-medal winning USA team at this year’s World Junior Championships. The 18-year-old’s father, Mark, captained BU. Kieffer Bellows (#9): A product of the USHL’s Sioux Falls Stampede and the NTDP, this Minnesota native boasts quite the shot. The 18-year-old is the fourth player in NTDP history to score 50 goals in a season, and should be drafted in the first round of the 2016 NHL Draft. Gabriel Chabot (#10): Chabot’s inclusion raised some eyebrows, but he’s coming off an impressive campaign for the Rochester Jr. Americans of the USPHL in which he scored 50 points in 44 games. Interestingly, this Canadian will turn 21 in the middle of December. Patrick Curry (#11): This 20-year-old has 147 games of USHL experience to his name, as he featured prominently for the Tri-City Storm and Bloomington Thunder. He tallied 30 goals and 36 assists across three seasons for those two squads. Patrick Harper (#21): There was some speculation that Harper would test a junior league, but he’s Commonwealth Ave. bound. A product of Connecticut’s prestigious Avon Old Farms School, the 17-year-old tallied 106 points in 49 prep school games. 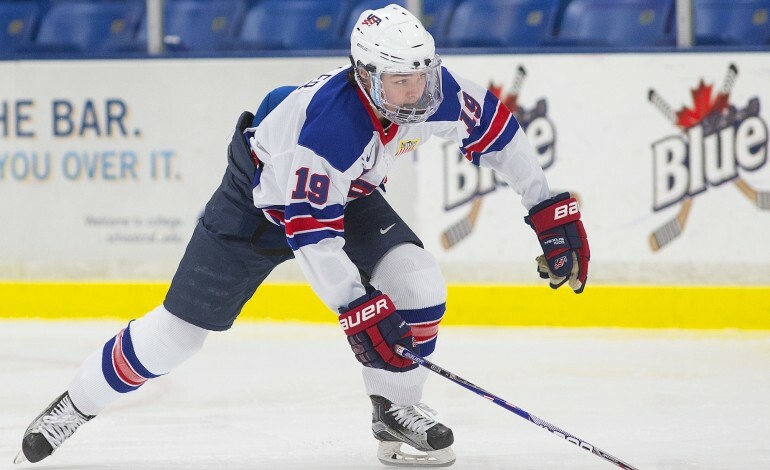 Clayton Keller (#19): Keller scored 37 goals and 70 assists in 62 games for the NTDP in 2015-16, altogether surpassing Phil Kessel as the program’s all-time leading scorer. Likely a center, the 17-year-old is often compared to speedy forwards like Patrick Kane and Zach Parise. Johnny McDermott (#28): Much like Harper, McDermott is coming out of the New England prep school circuit. He tallied 80 points across three seasons for the Westminster School. Quinn: “This is a class of quality & quantity. Every guy in this group brings something to our team that will help us compete for titles." Quinn: "… will play important roles as we strive for our ultimate goal of winning another national championship." Ask almost any fan of the Boston University men’s hockey team what excites them most about the 2016-17 season and you’ll hear an iteration of the same word: talent. Serving as an affirmation of sorts of what appears to be BU’s strongest underclassmen contingent in recent memory, the 2016 NHL Draft will take place June 24-25 in Buffalo, New York. There are five Terriers – including one returner and four highly-regarded incoming recruits – who are virtual locks to hear their name called at some point by front office members. To more easily sift through what’s in store at First Niagara Center, The Boston Hockey Blog has your complete, BU-centric breakdown of the Draft. Charlie McAvoy: NHL scouts are raving about the rising sophomore defenseman, and with good reason. One of two Terrier representatives on last year’s U.S. World Junior Championship team, the 6-foot-1, 211-pound blueliner was named a Hockey East All-Rookie selection. A native of Long Beach, New York, McAvoy finished his rookie season with three goals and 21 assists, often pairing with the recently-graduated Matt Grzelcyk. Kieffer Bellows: Without treading too deep into cliche-filled territory, Bellows simply knows how to find the back of the net. This future Terrier scored 50 goals and 31 assists for the U.S. National Team Development Program last year, becoming just the fourth forward in NTDP history to reach the 50-goal mark in a single season. Bellows, who recently turned 18, also nearly made the U.S. World Junior Championship Team. Dante Fabbro: The reigning British Colombia Hockey League Defenseman of the Year, Fabbro is touted by some NHL scouts as this year’s top draft-eligible blueliner. The 18-year-old played two seasons with the Penticton Vees and has featured prominently for Canadian youth teams. Altogether, Fabbro finished his BCHL career with 100 points, and it’s likely he’ll be a figurehead on Commonwealth Avenue for years to come. Clayton Keller: Still only a 17-year-old, Keller is likely high on every team’s draft board. This future Terrier scored 37 goals and 70 assists in 62 games for the U.S. NTDP in 2015-16, altogether surpassing Phil Kessel as the program’s all-time leading scorer. Keller is often compared to Patrick Kane and Mitch Marner, and that’s pretty darn good company for any prospect. Chad Krys: Admittedly, it’s hard to get a read on BU’s soon-to-be freshman defenseman. He has long featured for U.S. youth teams, and was a key component of the NTDP’s 2015-16 season. The slight, however, is many scouts thought Krys could be a first-round selection, only to see his stock drop. The talent is undeniably there – as demonstrated by the numerous World Junior Championship medals he boasts – and years of maturation under head coach David Quinn could be just what he needs. While not likely selections, it’s altogether possible that rising sophomore forward Bobo Carpenter and rising junior defenseman Brien Diffley get picked. Both were considered outside shots ahead of the 2015 Draft. Who most excites you ahead of the NHL Draft? Could McAvoy or one of the four future Terriers gain or lose stock? Feel free to share your thoughts below!